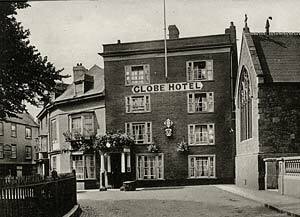 The Globe Hotel consisted of a four storey Georgian main building and an older, three storey building that contained a Tudor period oak panelled room. The hotel stretched from Little Stile, a narrow gate joining South Street to Cathedral Yard, to the corner of St Petroc's Church, in Cathedral Yard. Between 1573 and 1603 the site of the Globe was noted as "part of the Cathedral cemetery" converted into "a garden in the tenure of Jno. Ellacott". It is probable that this garden was the portion later occupied by the Georgian section of the hotel, next to St Petroc's. Then in 1707 it was "since converted into a dwelling house or houses". This may be the Tudor building and home of the Northmore family, the range of buildings on the left in the photograph. The first reference to it being an inn is from a baptism record which states "25th October, 1674 of Thomas son of William Fowler, Tapster at ye Globe". In 1772 a plan of the "Globe Tavern, Tennements and Buildings" was drawn up that indicated it granted to William Rigg, maltster. (D&CN&Q) It later became the terminal of the Exmouth stage coach. The tavern was noted as a centre for cockfighting in the 18th century, ironically, only yards from the Roman garrison cockpit. Local citizens used to meet there for the annual 5th November celebration of the attempted blowing up of Parliament by Guido Fawkes. 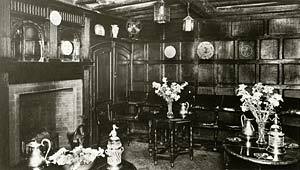 Its rooms were also used by Britain's first bee keeping association for their meetings between 1797 and 1807. The Globe was also important to Freemasonry in Devon when it became the meeting place in 1774 of the Provincial Grand Lodge of Devon Freemasons, founded by Sir Charles Bampfylde who was the Master of the Lodge. Sir John Graves Simcoe, the first Governor General of Canada was initiated into the Lodge at the Globe Hotel. In 1921 the hotel was bought from a hotel company by Mr and Mrs F G Brand - 8 years later they put it on the market for £12,500, but it was withdrawn from sale. Some of the entries in trade directories during the 19th and 20th-century. The hotel was lost to fire in the Exeter bombing of 4th May 1942, when the shops behind, on South Street caught fire and the flames spread to the Globe. It was described as 'damaged by fire' in a report but photographs show that it was completely gutted. Interior of the Globe Hotel. 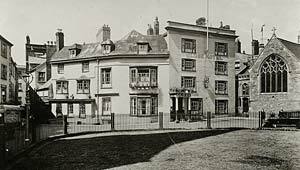 Another view of the Globe Hotel with St Petrock's Church on the right.